This post covers 5G Subcarrier spacing as compare to LTE, 5G Frame and Subframe, possibilities of different type of 5G NR slot depending upon the different subcarrier spacing and OFDM symbol. In 5G NR, subcarrier spacing of 15, 30, 60, 120 and 240 KHz are supported. As you see here, each numerology is labled as a parameter (u, mu in Greek). The numerology (u = 0) represents subcarrier spacing of 15 kHz which is same as LTE. And as you see in the second column the subcarrier spacing other than 15KHz, for 5G NR. NOTE: In LTE, there is only type of subcarrier spacing (15 KHz), whereas in NR, multiple types of subcarrier spacing are available. 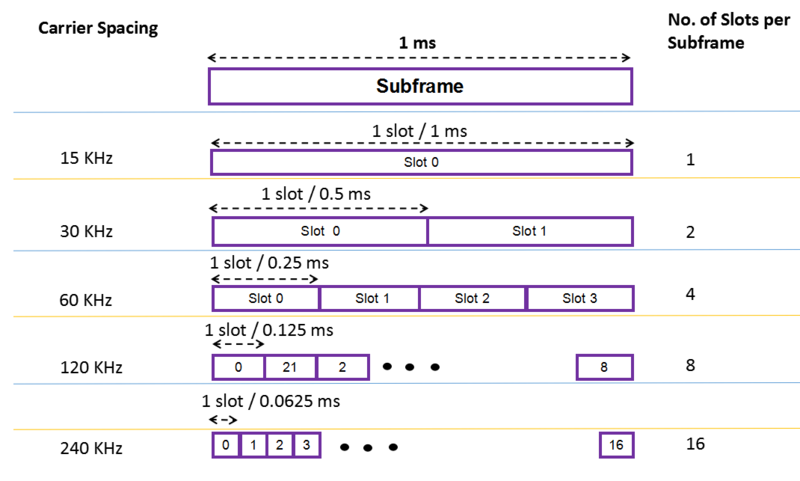 Each frame is divided into two equally-sized half-frames of five subframes each with half-frame 0 consisting of subframes 0 – 4 and half-frame 1 consisting of subframes 5 – 9. In Total, there are 10 subframes in one frame. Slot length gets different depending on different subcarrier spacing. The general tendency is that slot length gets shorter as subcarrier spacing gets wider. Actually this tendency comes from the nature of OFDM. NOTE: In LTE, there are fixed two slots per subframe, but in NR, no. of slot may vary. The number of symbols within a slot does not change with the numberology or subcarrier spacing. OFDM symbols in a slot can be classified as ‘downlink’ (denoted ‘D’), ‘flexible’ (denoted ‘X’), or ‘uplink’ (denoted ‘U’). In a slot in a downlink frame, the UE shall assume that downlink transmissions only occur in ‘downlink’ or ‘flexible’ symbols. In a slot in an uplink frame, the UE shall only transmit in ‘uplink’ or ‘flexible’ symbols.